Asolo loyalists were very eager to purchase their second pair of the Falcon GV as they were pleased with its performance on and off the trail. The underfoot cushioning of this day hiking boot received admiration from the majority. 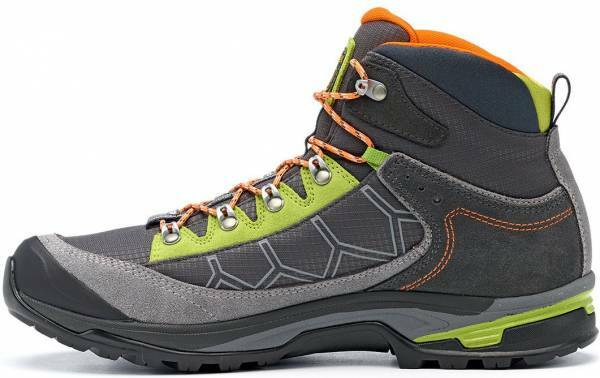 A hiking professional was delighted with the out of the box comfort of the Asolo Falcon GV. Most of the owners testified to the effective waterproofing of this pair. The Falcon GV from Asolo was commended by many wearers as it provided adequate ankle support. Plenty of users and experts complimented the glove-like fit of these hikers. According to numerous impressed users, this was indeed a lightweight day hiking boot. A small group of testers wished that the Asolo Falcon GV had deeper lugs. Some users had to replace the insole to get better arch support. Being a lightweight, comfortable and waterproof pair, the Asolo Falcon GV positively won the liking of outdoorsmen, may it be an expert or a newbie. However, being praised for all those good features does not equate to ticking all the boxes. There were hikers who weren’t satisfied with the outsole and the insole. Taking everything into account, the Asolo Falcon GV suits the needs of a modern hiker, a lightweight yet robust hiking boot. The Asolo Falcon GV hiking boot is primarily a boot for summer hiking, and it’s got pretty much everything you could ask for in such a model – from the breathability to the comfort, resilience and the light weight. Very comfy, very light, very capable and very hard to fault. Aside from some negatives, the boots look to be very well made and I can see them becoming a favourite for summer dog walks, forest trails and hills. It’s great to have boots of high quality that are lightweight and super comfortable. Using a 1.6 - 1.8 mm suede and Cordura upper, Asolo made the Falcon GV ideal for hiking and summer walking. It has a Gore-Tex laminate to bring breathability and waterproofing. A cushioned tongue and collar, rubber toe cap and heel pull tab complement the upper. Asolo, together with Vibram, developed the Redster outsole with the Megagrip compound. This sole has aggressive lugs that render traction on trails. The Falcon GV from Asolo has dual density EVA midsole for comfort and cushioning. A lasting board and anatomic footbed give stability and support. The Asolo Falcon GV is a waterproof hiking boot for men and women. It generally runs true to size and comes in standard width and sizes. Its classic lace-up closure delivers a snug and personalized fit to the user. The Redster outsole employs the Megagrip compound. This proprietary technology offers grip, adapts on most types of surfaces and grants durability. Its self-cleaning lugs prevent muck build-up and bite into ground surfaces. This day hiking boot from Asolo uses a dual-density EVA midsole . The high-density foam delivers a stable ride. On the other hand, the low-density EVA at the heel area maximizes cushioning and dissipates shock from impacts. Rendering additional protection underfoot is the Asoflex 00 SR lasting board. A Lite 2 plus anatomic footbed promotes comfort. The Asolo Falcon GV uses 1.6 - 1.8 mm suede leather and Cordura. This combination grants a durable and lightweight upper. The non-insulated Gore-Tex Extended Comfort laminate lines the inside of this day hiking boot. It’s a waterproofing component that also creates a breathable environment in the shoe. Its mid-cut design features a padded tongue and collar for comfort. A rubber toe cap helps protect the foot from accidental bumps and the pull tab on the heel assists in easy on and off. Another Gore-Tex boot from Asolo is the Fugitive GTX.